We often hear about the “Jane Effect”, which everyone experiences differently. For me, the “Jane Effect” is the emotions that one experiences after listening to Dr. Jane Goodall speak. One can walk into an auditorium not knowing what to expect, and then leave the auditorium feeling hopeful and empowered; feeling like they CAN make a difference and understanding that they DO have a part to play in making this world a better place. The “Jane Effect” changed my life and proves that we each have the power to do something to make a huge impact every single day. My name is Anna Katogiritis. I have been a long time lover of Jane and a vocal animal welfare and rights activist for many years. 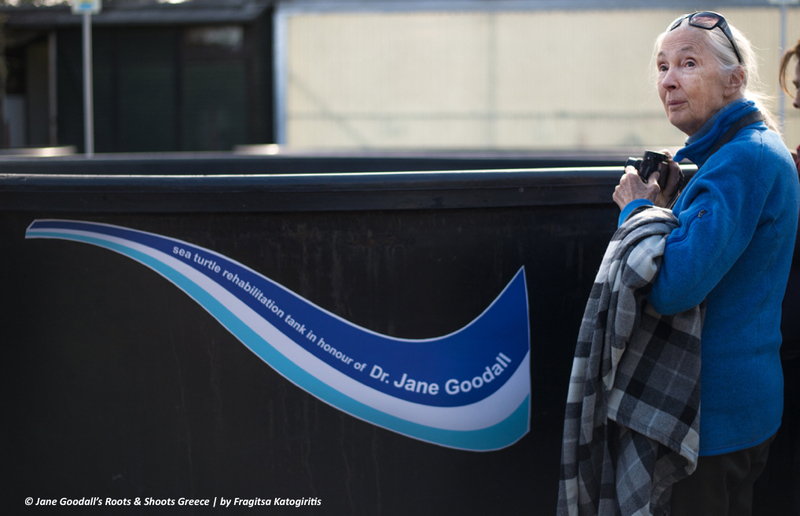 In 2015, I made a promise to Dr. Goodall that the Jane Goodall Institute’s Roots & Shoots program would start a chapter in Greece. Roots & Shoots is all about seeing young people take initiative and complete meaningful projects that have a positive impact in their local or global communities, for animals, humans and the environment. 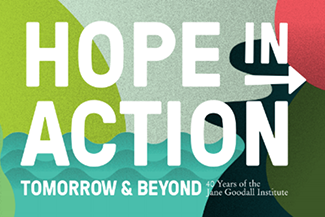 For Dr. Goodall, and myself, this program was what was missing in Greece as an opportunity for young people to feel hopeful and purposeful. During my internship at the Jane Goodall Institute in early 2016, we took the first steps to make this dream a reality. Jane’s visit to Greece in December 2016 marked the official launch of Roots & Shoots Greece, and defined what I believe is the true magic of the “Jane Effect”! Jane Goodall’s impact is felt in both large crowds and intimate moments. In Athens, Greece, during Jane’s visit in 2016, she delivered a speech at the Megaron Plus to an audience of one thousand people. With live translation in Greek, Athenians had the opportunity to listen to Dr. Goodall speak about everything from her childhood, to her early days studying chimps in Tanzania, to the creation of the Jane Goodall Institute and the Roots & Shoots program, bringing conservation alive through her charismatic storytelling. At a time when most citizens in Greece are going through economic hardships and many young people feel that they have no future, many people approached us after the lecture to express the immense amount of hope that Jane gave them. 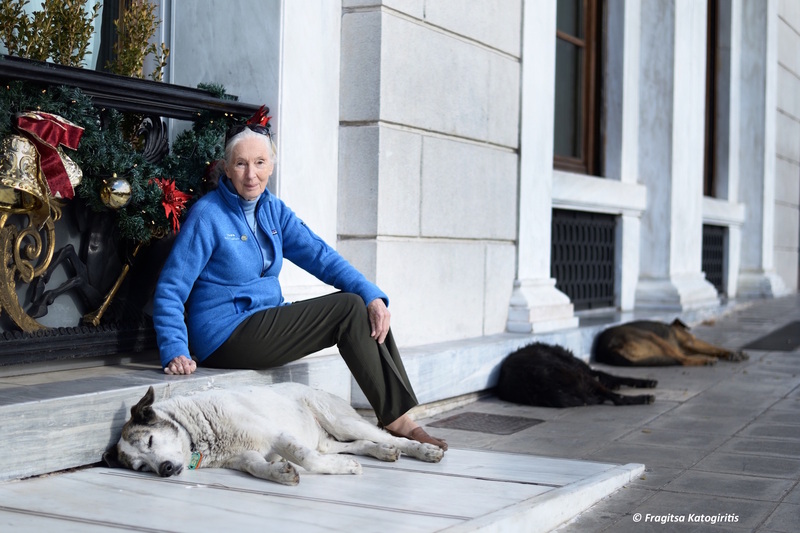 Dr. Goodall was also able to connect to people doing so much positive work in Greece. She had the opportunity to meet with volunteers who are currently helping with the refugee crisis, who have devoted countless hours, making a positive impact in the lives of people whose world has been torn apart by war in Syria and other countries. As a UN Messenger of Peace and someone who has witnessed tremendous human suffering during her travels, Dr. Goodall was very moved by this important meeting, of course offering her help. Dr. Goodall also visited the ARCHELON Turtle Conservation Center, where she learned all about the resident rescued turtles and current conservation efforts for the Caretta caretta species, and even had a turtle recovery tank named after her! 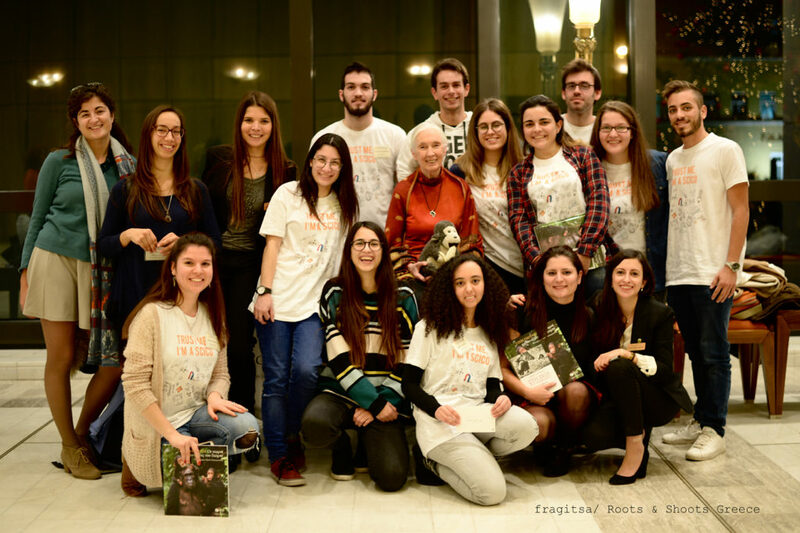 During a wonderful event held at the American Community Schools (ACS) of Athens, the first Roots & Shoots Greece groups displayed their projects and had the opportunity to listen to Dr. Goodall, which surely motivates the young people to keep going, but also gives Jane hope and motivates her to continue spreading her message! Jane and I also had the opportunity to discuss the stray animal population issue. This is of particular interest to me, as my passion for animal welfare and animal rights stems from my childhood experiences of witnessing animal abuse and neglect. Dr. Jane enjoyed connecting with stray dogs outside her hotel, and it wasn’t surprising that she wanted to spend some time with them. In an effort to promote change after animal abuse in Karpathos has increased over the past 3 years, and a particular tragedy involving a dog being hanged from a tree near a soccer field where kids were playing, I have created a petition as Roots & Shoots Greece, through which I am hoping to collect as many signatures as possible (we already have almost 4,000 signatures, and are hoping to get over 5,000!). So far, thanks to everyone’s participation, the board of the Karpathos municipality has agreed on a proposal to create greater protections and harsher punishments for animal abuses! This only fuels my hope that through Roots & Shoots Greece I can make a true difference for animals, humans and the environment in Greece and beyond. Jane Goodall’s Roots & Shoots Greece became a non-profit in Greece March 2017, and our core team currently consists of Karita Mitrogogos and Efi Douvitsa. All of this, would not have been possible without the generous donation and support of Mr. Jim Demetriades of Kairos Ventures. 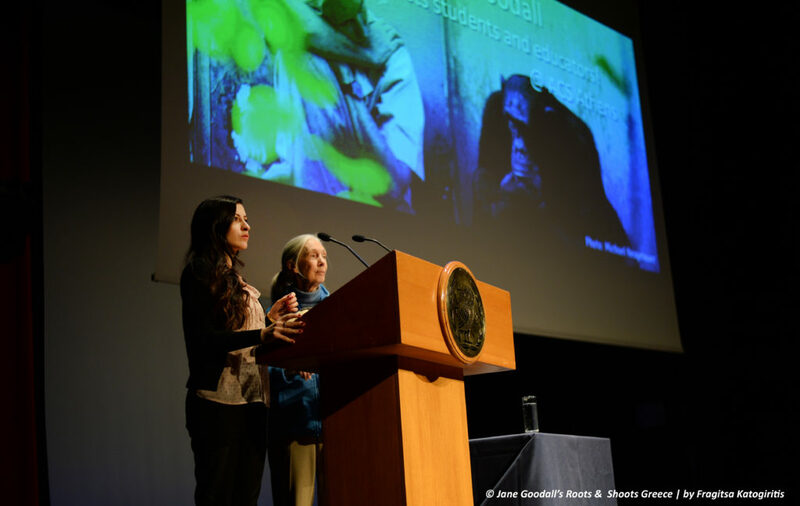 I would like to also thank the amazing JGI family, our wonderful volunteers in Greece, the NGO SciCo (Dr. Anagnostopoulos and Dr. Julie Kyriazi), the educators who are implementing the program in their schools, and last but not least – Dr. Jane Goodall. This Roots & Shoots happily adds its name to the many others in nearly 100 countries around the world, all a part of Dr. Goodall’s vision through the Jane Goodall Institute, to inspire the next generation of compassionate, environmentally conscious do-gooders! If you are interested in joining Roots & Shoots Greece, contact us here.